Most of the stops on our trip were inspired by my oldest daughter’s interest in volcanoes. Since the volcanoes in Hawaii were out, Mount St. Helens was an acceptable second. 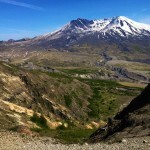 If you ask, Emily will tell you Mount St. Helens was her favorite stop during our vacation.